Play the Part is a staple event, featured during our annual Black Culture Awareness Week. 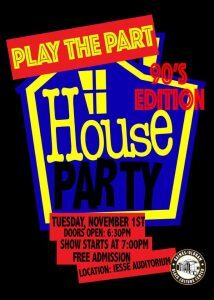 This year’s theme is the “House Party Edition” in which participants will portray artists from the 90s. Come out and support your fellow Tigers! The show is on November 1st, doors open at 6:30pm and the show starts at 7pm! Sponsored by the Gaines/Oldham Black Culture Center.